President Barack Obama has pitched a controversial trade agreement it was negotiated between the United States and 11 others at the headquarters of Nike. The footwear giant says it expects to add 10,000 domestic jobs if the deal is approved. The president was at the shoe company’s corporate headquarters on Friday to speak in support of the Trans-Pacific Partnership, or TPP, a 12-nation agreement in the works that would establish new rules for tariffs with regards to trade involving the US and a host of Pacific Rim partners. “If I didn’t think that this was the right thing to do for working families then I wouldn’t be fighting for it,” Obama from a stage outside Nike’s main office in Beaverton, Oregon. Earlier in the day, Nike CEO Mark Parker said approval of the TPP would “accelerate investment in advanced footwear manufacturing” in the US. 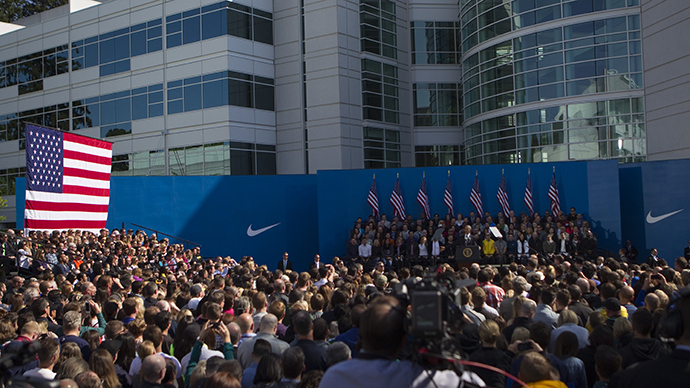 “Footwear tariff relief would allow Nike to accelerate development of new advanced manufacturing methods and a domestic supply chain to support US-based manufacturing," the company said in a statement, through which it could expect the creation of up to 10,000 manufacturing and engineering jobs, as well as perhaps 40,000 gigs as an indirect result during the next decade. But the opinions of the sneaker king and US president aren’t exactly universal. Police in riot gear was deployed outside of the Nike campus on Friday morning, local media reported, in order to monitor demonstrations who had gathered to protest the TPP. Indeed, negotiations between potential TPP partners–Australia Brunei, Canada, Chile, Japan, Malaysia, Mexico, New Zealand, Peru, Singapore, the US and Vietnam–have been done entirely behind clothes door so far, with much of the few details having been disclosed by WikiLeaks, the anti-secrecy group. A final draft of the deal would be signed by the president and then be open for comment for a 60 day period before Congress could either approve or reject the agreement. President Obama touted the TPP at Nike later in the day during an address in which he insisted approval would be good for the American economy and the rights of workers abroad, and disputed concerns of accountability made by the trade deal’s critics. Currently, around one-third of Nike’s international manufacturing is carried out in Vietnam, and poor labor conditions there have time and time again propelled the shoe company into the sights of those who say the corporation is exploiting so-called sweatshop workers. According to the president, approval of the TPP would preserve America’s own economic interests at home while strengthening workers’ rights abroad. Under the deal, he would, countries would have to adopt new working conditions and standards, and Vietnam would even enact a minimum wage and give workers the freedom to form unions. “That would make a difference. That helps to level the playing field and it would be good for the workers in Vietnam even as it helps make sure that they’re not undercutting competition here in the United States,” the president said. Friday’s event was preceded by the release of the latest jobs report in which the US Labor Department reported that the American economy added around 223,000 jobs last month.